Aroostook County – In celebration of Community College Month and National Poetry Month, Northern Maine Community College is hosting its annual Creative Writers’ Reading Series which began in March and will continue throughout April. The series brings accomplished authors from around the northeast to Presque Isle, and gives them an opportunity to share from their works. In addition to author readings, on April 26th creative writing students from NMCC will be sharing from their original works. The guest writers for this year are John Corrigan, Diane Les Becquets, and Melanie Brooks. Although Corrigan made an early visit to campus on Friday, March 22nd, there is still time to come hear the other two authors perform readings. John Corrigan is the author of nine novels published under his own name and pen names D.A. Keeley and K.A. Delaney, including This One Day (2015) and Destiny’s Pawn (2016). He serves as the English chair at Northfield Mount Hermon School, where he teaches English and occasionally coaches golf and hockey. A Maine native, he attended the University of Texas at El Paso, where he earned a master’s of fine arts degree. Prior to teaching at Northfield Mount Hermon, he was an instructor at Northern Maine Community College and at the Maine School of Science and Mathematics. Diane Les Becquets (April 19 – Noon & 6:30 p.m.) is the author of The Last Woman in the Forest (March, 2019) and Breaking Wild, both published by Berkley, Penguin Random House. Breaking Wild, an Indie Next Pick and a national bestseller, was the recipient of the Colorado Book Award in Fiction, the New Hampshire Outstanding Work of Fiction, and was shortlisted for the Reading the West Book Award in Fiction. Les Becquets is also the author of three young adult novels: The Stones of Mourning Creek, Love, Cajun Style, and Season of Ice, the latter being the recipient of a Pen American Fellowship. Other awards she has received include a BCCB Blue Ribbon Award, the Maine Lupine Award, ALA Best Book of the Year, Foreward Reviews Gold Winner Book of the Year, Volunteer State Book Award Selection, and Garden State Book Award Finalist. She has served as a judge for the New Hampshire State Council on the Arts and the Maine Arts Commission, and has taught writing workshops at venues across the country. Melanie Brooks (April 26 – Noon & 6:30 p.m.) is the author of Writing Hard Stories: Celebrated Memoirists Who Shaped Art from Trauma (2017), a work which profiles her conversations with some of America’s most prolific writers. She graduated with a degree in English from Gordon College and then earned a Bachelor of Education from Dalhousie University and a Master of Science for Teachers of English from the University of New Hampshire. She currently teaches professional writing at Northeastern University in Boston, Massachusetts, and Merrimack College in North Andover, Massachusetts, and creative writing at Nashua Community College in Nashua, New Hampshire. She completed her MFA in creative nonfiction through the Stonecoast Creative Writing Program at the University of Southern Maine. In addition to the readings, each author visits classrooms to have focused time with the students. This is the twelfth consecutive year that NMCC has hosted these events. On March 22nd, author John Corrigan visited NMCC campus as part of the Creative Writers Reading Series. 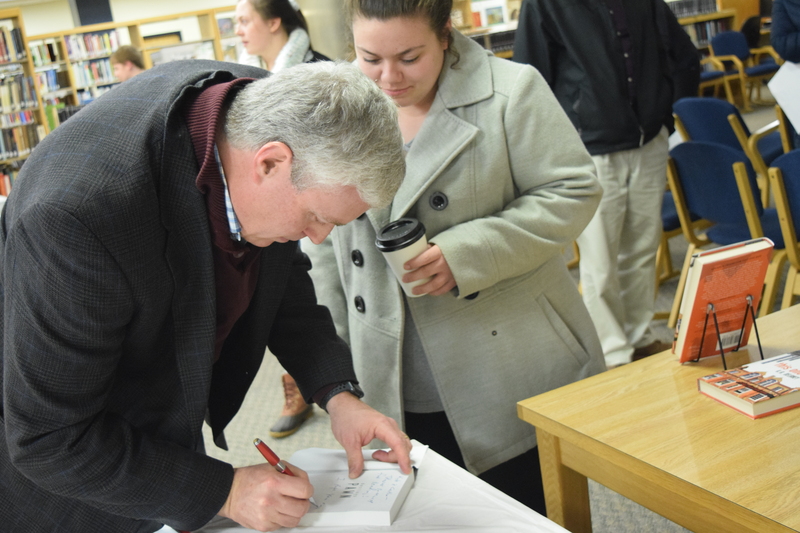 After the event Corrigan signed copies of his books, including Destiny’s Pawn, which is about a female border patrol agent working in Aroostook County.